For children 5+ years and older who have had difficulty learning how to ride a 2-wheeler. Occupational therapists, familiar with the social and motor challenges relevant to many children with special needs, will run the program to be able to adjust to the individual needs of each child. The program is run in a group of children depending on the size of the space available. All parents are encouraged to observe and watch the group to be able to practice the skills at home which helps increase the speed in which a child learns. Programs have been run indoors and outdoors depending on the season. Families need to bring their child’s bicycle and helmet to each class. Free screening to determine eligibility. 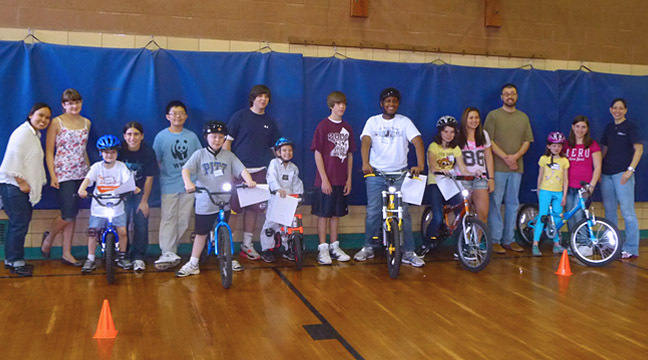 Our Fanwood Bike Riding program has been partially funded by a grant received by the Borough of Fanwood, NJ from the New Jersey Department of Community Affairs: Recreational Opportunities for Individuals with Disabilities (ROID) to help bring innovative, community-based recreational programs to children with special needs. The support of Mayor Mahr and the Borough of Fanwood has helped us create a model of programming that can be replicated in other municipalities throughout New Jersey. Please bring water and your child’s helmet and bike to each class.